Amylulita says...: Los Explosivos...the kinda rock n' roll I love! I just finished watching "End Of The Century" - the story of The Ramones so it's only fitting that I come upon Los Explosivos on myspace today. 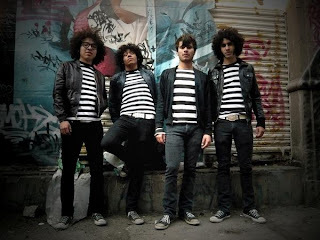 These guys are from Mexico City, they wear black and white stripped t-shirts like Joey Ramone, and well, you check em' out yourself and make your own decision.